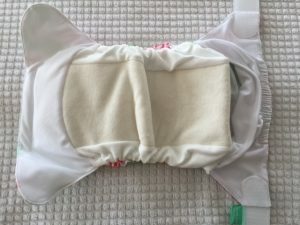 I’ve been involved in the cloth diaper industry in some form or fashion since 2001 and have seen and felt just about every type and style of cloth diaper on the market. Most cloth diapers are usually known for one or two very distinctive features. Usually someone will prefer one closure over the other (snap versus hook and loop/velcro type). Personally I usually go for snap closing diapers mostly due to durability. Quite honestly when you are first trying out cloth diapers I do recommend getting a hook and loop closing diaper just because they are so easy to use and like a disposable. The issue with choosing a hook and loop style for an entire cloth diaper stash is that over time the hook and loop will wear out, will get pilled, and sometimes not even work anymore. This is not true with the TotsBots brand of cloth diapers. I can honestly say this brand has the most durable hook and loop closures I have seen on ANY cloth diaper. The inside of the TotsBots EasyFit Star Diaper. Bamboo layer next to skin; pocket sleeve towards back of diaper. In fact I just found a TotsBots cloth diaper a few weeks ago (see picture right) when I was going through some baby items I had saved from years ago. This was well over 7 years ago that I saved this diaper. I actually saved my sons entire cloth diaper stash (he is now almost 9) until about a year ago. I realized at the age of 42 that I wasn’t going to have another child and donated the stash to Giving Diapers Giving Hope (organization the provides free cloth diapers to low-income families). Well…I ended up getting re-married and I am expecting baby #4 this summer! Now this cloth diaper was used for well over 2 years and washed at least every other day. When I pulled the cloth diaper out of the box I was amazed at how nice it still looked and the hook and loop tape worked just as well as it did on day #1. The TotsBots EasyFit Star Diaper is an All-In-One Cloth diaper that has 2 layers of bamboo with a layer of polyester microfiber sandwiched between as the absorbent layer. This is an ideal combination of fabrics as natural fibers are next to your baby while fast absorbing, moisture pulling fabric is underneath. The diaper has a ‘pocket-sleeve’ located on the back side. There are 2 reasons for this: The first is that it allows the entire insert of the diaper to agitate out which still being attached. This enables quick drying without sacrificing absorbency. The second reason is that you can add any type of insert/double inside this ‘pocket-sleeve’ to create the ultimate nighttime cloth diaper. We used the TotsBots exclusively with my 3rd child at nighttime because it was the only cloth diaper system that was consistently leak-proof. 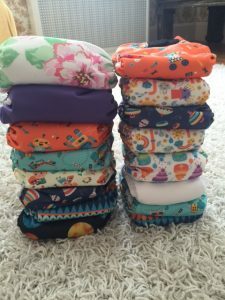 I can honestly recommend the TotsBots EasyFit Cloth Diaper for your entire stash. Even though there is the initial investment this diaper can easily diaper 2-3 children (as long as you following manufacturer washing instructions). Hands down it is my favorite over-all cloth diaper…in fact most of my new cloth diaper stash for baby #4 is TotsBots! 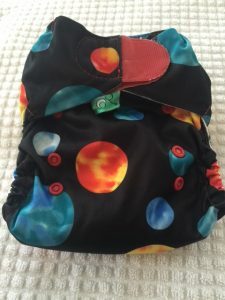 This entry was posted in Blog and tagged cloth diaper review, cloth diapers, green team distribution reviews, tots bots review. Bookmark the permalink. I was able to score 10 tots bots easyfit V3 and V4 (mostly V4) for $80. I am obsessed with the prints and the aplex on these diapers. I have one that the Velcro is in rough shape (still works great) but I loved the print so I had to get it! Some of my diapers have fuzzies in the tabs but they still have a super grip and taking out fuzzies is an easy to fix. Some also have worn elastics however with a little TLC these diapers will be looking good as new. I would totally recommend these new and used. LOVE my tots bots easyfit… now to get my hands on a tots bots teeny fit.